MR Online | Who’s working for Facebook? There are plenty of reasons to be interested in—and, even more, concerned about—Facebook. Many of them are raised in the recent review of Facebook-related books by John Lanchester: the fragmentation of the polity (via the targeting of posts), the dissemination of “fake news” (which played an important role in the 2016 U.S. presidential election), the undermining of other livelihoods (such as journalism and music), the level of surveillance of users (much more than any national government), the violation of anti-monopoly rules (via individualized pricing), and so on. For all the talk about connecting people, building community, and believing in people, Facebook is an advertising company. But it still doesn’t get at the issue of who works for Facebook, who creates that value, what the class structure of Facebook (and Google and other such companies) is. Lanchester’s answer is that we, the two billion or so of us who use Facebook, actually work for the social-media giant. Access to an audience—that unprecedented two billion people—is a wonderful thing, but Facebook isn’t in any hurry to help you make money from it. If the content providers all eventually go broke, well, that might not be too much of a problem. There are, for now, lots of willing providers: anyone on Facebook is in a sense working for Facebook, adding value to the company. Perhaps the biggest potential threat to Facebook is that its users might go off it. Two billion monthly active users is a lot of people, and the ‘network effects’—the scale of the connectivity—are, obviously, extraordinary. But there are other internet companies which connect people on the same scale—Snapchat has 166 million daily users, Twitter 328 million monthly users—and as we’ve seen in the disappearance of Myspace, the onetime leader in social media, when people change their minds about a service, they can go off it hard and fast. But what I find interesting is the fact that Lanchester can write a longish essay on Facebook and never once mention the word labor—and the only people who seem to be working are Facebook users. 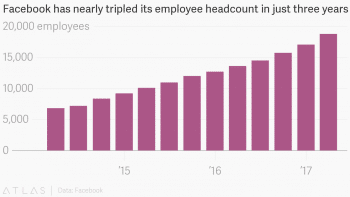 What about Facebook’s employees? 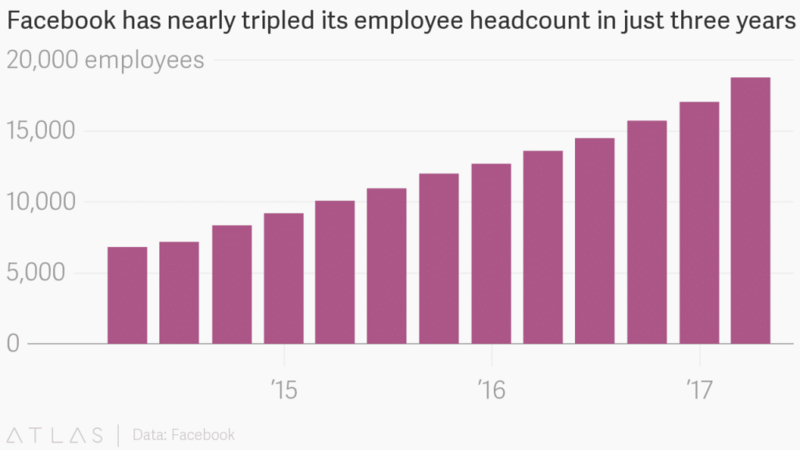 As it turns out, Facebook reported a headcount of 18,770 in its first-quarter earnings release (and likely employs more workers, as independent contractors for specific projects). Why don’t we consider them to be the ones who create the value realized by selling space to advertisers and information to others who purchase the data gathered by Facebook? And Facebook employees the ones who are working for and being exploited by Facebook’s board of directors? When General Motors sells cars, the people who purchase and drive the cars aren’t being exploited; GM workers are. The same is true for other corporations, from Abbott Laboratories to Zoetis (which, along with Facebook, make up the Standard & Poor’s 500, covering about eighty percent of the American equity market by capitalization). They’re employees, not their customers, are the ones who create value and surplus-value. So, why is Facebook (and, by the same token, other social-media and internet companies) different? The answer, I think, is our relationship to the commodity being produced and sold is different. We purchase cars—and, if we’re aware of it, we know they’re produced by exploited auto-workers. But in the case of Facebook, we’re not purchasing anything at all, at least directly. We post content to our friends or advertise a business or try to form a community. And then it’s Facebook that collects data about us and sells it—not to us but to others, other corporations. Without our participation, of course, Facebook would not have anything to sell, and therefore no way of making a profit. And, more generally, we seem to be spending more and more time involved in activities for which we are not remunerated but are essential for the profit-making activities of corporations we don’t work for. We post on social-media sites. We use search engines to navigate the internet. We search for flights. We check-out and bag the commodities we purchase at retail stores. And so on. But I’m not convinced we’re creating value and subjecting ourselves to class exploitation. We may be performing labor but we’re not working for those corporations. And we are being commodified, and participating in our commodification. But we’re not working for those corporations. Their employees are—and they’re the ones who are being exploited. 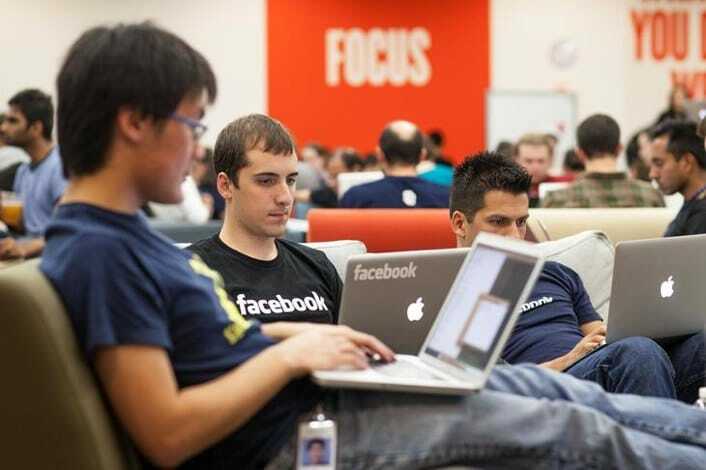 * Although, according to a recent report, Facebook may exaggerate the reach of its advertising platform: it claims to reach millions more users among specific age groups in the U.S. than the official census data show reside in the country.